WELCOME TO Kentucky State University's Survey of Production Methods course taught by Dr. Jim Tidwell. This Internet course operates on Blackboard. Each class is a video module that you view as often as you wish. Dr. Tidwell will communicate with you through Blackboard Announcements and personal e-mail. You may contact him by phone or e-mail. The Kentucky State University Aquaculture course Survey of Production Methods is a 3-credit-hour Internet course offered to undergraduate and graduate students. 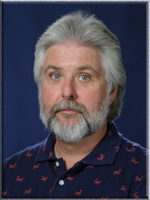 Dr. Jim Tidwell, james.tidwell@kysu.edu, Professor and Chair in the Division of Aquaculture at KSU, will teach the course. The graduate-level Survey of Production Methods course is intended for students who are completing or already have a bachelor’s (or higher) degree. During the course, students take five online tests and write a scientific review paper on a topic agreed upon by the student and instructor. Why take the Survey of Production Methods Internet course? An online course is perfect for persons who have limited time, and may not be able to attend class at a particular hour. Also, Web courses provide subject matter that may not be available at a nearby school. Specifically, people working with fish who need to manage, control and treat water quality, and anyone who just needs or wants college credit at the undergraduate or graduate level are welcomed to enroll. james.tidwell@kysu.edu to discuss course specifics and receive consent for acceptance into the course. U.S. students should contact the instructor and request enrollment information. International students (countries other than U.S.) should receive instructions for registration from Dr. Jim Tidwell. 3. Kentucky State University will contact the student about payment arrangements. Registration is not complete until the student has paid tuition and fees. 4. The instructor will contact each student by e-mail to provide initial course instructions before the course begins. A working e-mail address is required for each student. The course instructor recommends the textbook Aquaculture Production Systems, edited by James H. Tidwell. This text is required for all graduate level students and only recommended for undergraduate students. The text book can be purchased from Amazon.com. Student should receive consent of instructor for acceptance into the course. * wishes to add an aquaculture production systems course into his/her present university curriculum. * already has a degree in biology or some other area and is interested in aquaculture production systems. * wants to get credit hours without attending a traditional classroom. What about tuition and fees?